Huffman MetroPark, by its very name, draws connections to bicycles for local residents. The park and earthen dam within it are named after the Huffman family, founders of the Huffy Bike Corporation back in 1892. Horace Huffman, Jr., became a community organizer who pushed for the development of river bikeways in the 1970s. These trails are the foundation of our more than 330-mile paved trail network today. Huffman MetroPark is a great location for cyclists to connect to the Miami Valley paved trails. Those looking for a bit more adventure can visit the park’s Mountain Biking Area (MoMBA) — filled with hardwoods, a rock-bottom creek, great hills and a rock-filled ridge with trails that offer a perfect progression from easy to advanced, including a Tot Track and Beginner skills area. MoMBA trails will be closed if wet conditions risk damage. For up-to-date trail conditions and closures, please call (937) 277-4374. Huffman Dam is part of a system of five earthen flood control dams built, and still managed by, the Miami Conservancy District after the flood of 1913. The construction of the dam required moving railroad lines and remains of their bridge abutments, which still can be seen along the Mad River at the north end of the park and from the bottom end of the hill on the hiking trail at the south end. Hike or bike across the top of the dam to get scenic views and connect to the 330-mile regional paved trail network. MetroParks has the only trails in the area built specifically for and open exclusively to Mountain Biking at the MetroParks Mountain Biking Area (MoMBA) within Huffman MetroPark. MOMBA provides more than 9 miles of trails for riders from beginners to the most advanced. New for 2016 are several improvements, including a Beginner trail, a Tot Track, restrooms, water and a fixit station. This scenic stream flows cool, swift and clear during most of the year due to the numerous springs from glacial deposits in west-central Ohio that feed it. Lush forests and abundant wildlife can be found along its banks. The river provides great fishing opportunities with a local population of brown trout, smallmouth bass, largemouth bass, rock bass, bluegill, crappie and carp. Paddlers can put in upstream and take out before reaching the dam. The Mad River was designated as a state water trail in August 2010. Learn more about the Mad River Water Trail. The Mad River Trail connects to the park at the top of the Huffman Dam. Taking this paved trail west will lead users through Eastwood MetroPark into downtown Dayton. Heading east, users can connect with Wright-Patterson Air Force Base, the Air Force Museum, Huffman Prairie Trail, and the Kauffman Avenue Bikeway, which extends to Wright State University and Fairborn. Learn more about the Mad River Trail. The Huffman Prairie Trail is part of the statewide Buckeye Trail, connecting Huffman MetroPark with downtown Fairborn. Along the trail, users will pass the Wright Brothers Memorial Park and the Huffman Prairie State Natural Landmark, one of the largest prairie remnants in Ohio and a unique part of the Dayton Aviation Heritage National Historic Park. In the summer of 1919, workers digging the outlet tunnel for Huffman Dam unearthed a giant trilobite fossil of the genus Isotelus. This 14.5-inch by 10.5-inch fossil became known as the Huffman Dam Trilobite and is one of the largest complete trilobites ever found. It was donated to the Smithsonian Institution in Washington, D.C., and has been on display there since 1919. The Isotelus trilobite is Ohio’s state fossil. The lake at Huffman MetroPark was created by the removal of soil for the construction of the adjacent earthen dam after the 1913 flood. Fed by the waters of Mad River, the lake rises and falls with the operation of the dam. Bass, bluegill, catfish and carp can be caught in the lake. The lake and surrounding habitats draw many migrating birds, including many species of ducks, gulls, herons, songbirds, woodpeckers and birds of prey. There is access for nonpowered watercraft at the Lake View entrance. The Buckeye and North Country Trails pass through Huffman MetroPark. This section of the Buckeye Trail is part of a 1,440-mile continuous loop that encircles Ohio. The North Country National Scenic Trail stretches across seven states and will be 4,600 miles long when completed. These trails link and make historical and scenic features accessible and provide long-distance hiking. Learn more about the BT/NCT. Protecting our rivers, lakes and other bodies of water is an important component of Five Rivers MetroParks’ comprehensive conservation strategy. You can compare river and lake habitats with a side-by-side study when you hike along the peninsula at Huffman MetroPark. Park at the 4439 Lower Valley Pike entrance or bike across the Mad River Bikeway connection and walk along the peninsula that borders the lake and Mad River. There are ADA accessible parking areas and an accessible restroom. MoMBA has a drinking fountain near the restrooms that is available seasonally from Apr. 1-Oct.31. There is no water available at the Overlook or Lake View entrances. Bike and pedestrian access is available via Mad River Trail. The overlook entrance has a pit toilet open year-round. Lake View has a portable toilet open year-round. MoMBA has a pit toilet with facilities for both men and women side that is also open year-round. Lake access at the Lake View entrance offers anglers and boaters the ability to put in row boats and other non-motorized watercraft. The Mad River Trail connects this park with Wright-Patterson Air Force Base, Eastwood MetroPark, downtown Dayton, and the larger bikeway network. In addition, the Huffman Prairie Trail connects Huffman MetroPark with downtown Fairborn. The park contains significant bottomland hardwood habitat – trees that can tolerate periodic flooding and soil saturation, which often occurs when the Mad River flows high and the adjacent dam is in operation. The main park also includes a designated meadow, shallow lake and frontage along the Mad River. These habitats draw many migrating birds including many species of ducks, gulls, herons, song birds, woodpeckers, and birds of prey. The area of the park near MoMBA contains significant mature upland hardwood forest, young forest in succession and meadows. These forests are managed by MetroParks to maximize forest size and ensure a diverse future forest. The lake is also managed for wildlife habitat and recreational fishing. The Mad River and the lake offer a diverse choice of fishing opportunities at Huffman MetroPark. Bluegill, Catfish, and Carp can be caught in the lake as well as the river, along with Trout and Smallmouth Bass. The park has over three miles of wooded and open meadow trails for walking, running and cross-country skiing. Get a scenic overlook of the park by hiking the section of trail on the dam. Discover year-round bird watching. Huffman Lake, the Mad River and natural vegetation provide a welcoming home to red-tailed hawks, herons, great horned owls and several types of woodpeckers; in spring and fall, many migratory birds and ducks will make stop overs . Evening hikers may spot bats in flight. See our recent bird surveys for species. During the dam construction in 1919, workers discovered a giant trilobite fossil. The Huffman Dam Trilobite is one of the largest complete trilobites ever found. Measuring 14.5 by 10.5 inches in size, it remains on display at the Smithsonian Institute in Washington, D.C.
Geocaching is an activity combining technology and nature, using GPS to search for and find “caches” hidden throughout the world. Visit www.geocaching.com and search by location to get started. Then head out on an adventure to find the geocaches hidden in this park. Huffman Dam is one of the five earthen dams built in the early 1900’s by the Miami Conservancy District. There are remnants of old railroad bridges and buildings which had to be moved because of the dam. The land the park now sits on was part of the Mad River flood control system created in 1922 by the Miami Conservancy District. It was leased to MetroParks in 1966 and the park opened to the public on April 1, 1967. Read more about the history of the park. Along the north section of trail, take a moment at the historical marker for the Kirtland Camp. Members of the Mormon community camped for a month along the banks of the Mad River on their way to Missouri. While encamped, members worked on a section of the Springfield-Dayton turnpike. The park has over three miles of wooded and open meadow trails for walking, hiking, or running. The trails offer views of the lake and Mad River. 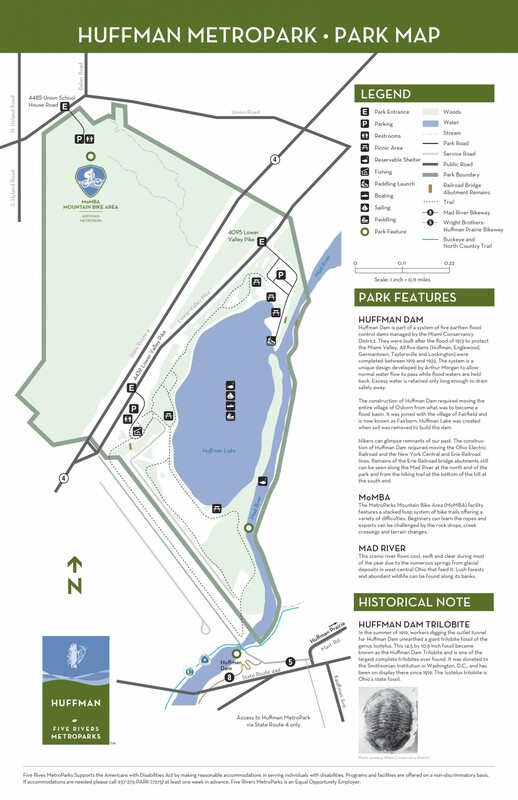 Hike to the south, and the trail section on the dam offers an overview of the park. Look for the remains of the Erie Railroad bridge abutments. Along the north section of trail, take a moment at the historical marker for the Kirtland Camp. The Buckeye Trail (BT), Ohio’s State Trail, and the North Country National Scenic Trail (NCT) run together through Huffman MetroPark. These long distance trails are co-aligned through the Dayton area as they are through much of Ohio, locally following the Mad River and Great Miami Recreation Trails. The trails are marked by 2 x 6 inch blue blazes along the route and volunteers work closely with the land managers to promote the trail and maintain the blazes. MoMBA is a premier sustainable single-track mountain bike specific facility. The trails were built as a partnership between FRMP and the Miami Valley Mountain Biking Association (MVMBA). It sports nine miles of trails ranging from beginner to advanced, with punchy climbs and a little bit of everything when it comes to features. Mature hardwoods, creek crossings, switchback climbs and even a rock garden make this one of the best and most diverse trail systems in the region. Huffman is managed for natural diversity, from the wooded meadows to the river bottom lands to some old growth forest located in the MoMBA section of the park. The habitats draw many migrating birds including many species of ducks, gulls, herons, song birds, woodpeckers, and birds of prey. Explore unique meadows and wooded areas within the floodplain. Discover year-round bird watching. Lake access at the Lake View entrance offers paddlers the ability to put in canoes, kayaks or stand up paddleboards. Reserve the Redtail shelter for your exclusive use using our online reservation system. Unreserved sheltersare available on a first-come, first-served basis. Picnic table sites also are available. The park has over three miles of wooded and open meadow trails for cross-country skiing. Cross-country ski the picnic areas and open meadows. Hiking trails are open all winter long in most MetroParks, including Huffman. Get a scenic overlook of the park by hiking the section of trail on the dam. Birding is a great way to learn about nature and get outside in your parks. From young to young at heart, people of all ages can enjoy this activity year round. Winter in Ohio offers many opportunities to explore the woods for songbirds.